Sewell, Gavin. & Cheung, Chrissy. 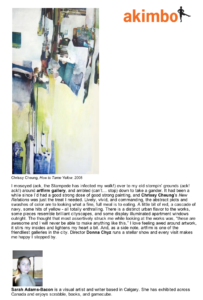 ‘One of a Kind: The Experience of Painting’, essay, Eastside Culture Crawl Arts Festival. Archambault, Luc. “Chrissy Cheung et l’effervescence du geste”. Westmount magazine.